All Banner Advertisements are PREPAID, i.e., no payment, no display. Prices are quoted in United States Dollars (USD) and are NET of all agency fees. All prices are quoted “Per Calendar Month”. Banners will start at 12:01 AM following receipt of payment and end at 12:00 Midnight one month later. Companies currently advertising on a page have first right to renew banner at published Rate Card price. Advertising Rates are adjusted from time-to-time to reflect market conditions. Renewal invoices will be sent with sufficient notice for renewal payment to be processed and received prior to banner expiration. If payment is not received by renewal date your ad will cease until payment has been received. You will be provided your full paid display time when funds are received. Contracts for advertising are negotiated and signed before any advertising is put up on the site. 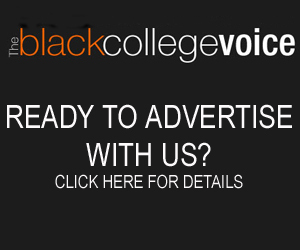 Blackcollegevoice.com has the right to refuse any advertising that it deems inappropriate for the site.We offer special rates for educational institutions. Contact us at HBCUnews@blackcollegevoice.com for details. All submitted ads should be in ” .jpg “ or .pdf image format, resolution 72 dpi, colors minimized as much as suitable for your specific needs. We can assist you with image format conversion. We do not accept animated ads or pop-ups. Who creates the ad banners? Advertisers create ads. Blackcollegevoice.com does not create ads for outside companies.